Can't make it to Central Park this Christmas? No worries, put on your skates and head Downtown to ice skate in Discovery Green this winter! And if you're too Texan to venture onto the ice, you can sit by the Lake House and watch everyone skate while enjoying a cup of hot cocoa. 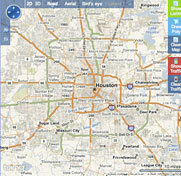 Click and drag your mouse around the image to see a 360 degree view. The trees of Brown Promenade have been illuminated with large globes of photographs taken by local elementary school children and compiled in this installation by David Graeve. Click and drag your mouse around the image to see a 360 degree view. 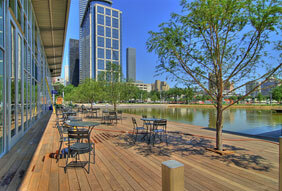 Green is the new color for fall, 2007, when the Houston Downtown Park Conservancy is slated to unveil downtown's new oasis - a beautifully-landscaped inner-city woodland, Discovery Green, featuring a multitude of amenities designed to enhance Houston living. 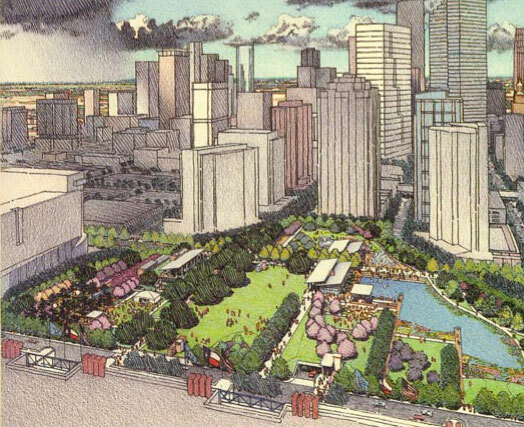 Look for the Discovery Green, encircled by Avenida de las Americas, Lamar, McKinney, and La Branch, to be transformed from from an asphalt hodgepodge to a world-class, multi-use 11.8-acre green space. 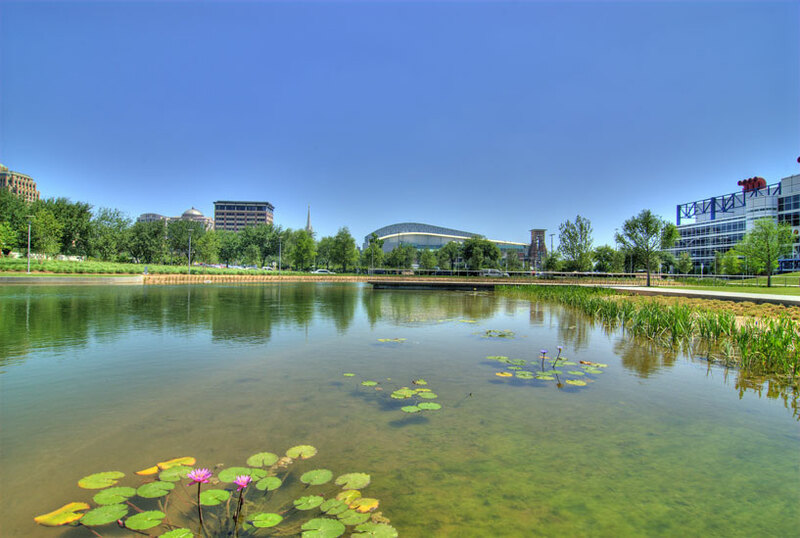 A "Great Lawn," jogging trail, dog run, two Schiller Del Grande restaurants, the Grove and The Lake House, children's playground and amphitheatre are just a few of the elements planned to enhance Discovery Green. 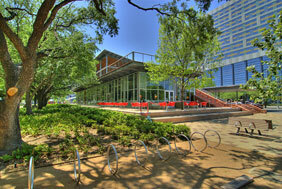 "Discovery Green will provide a little something for everyone. 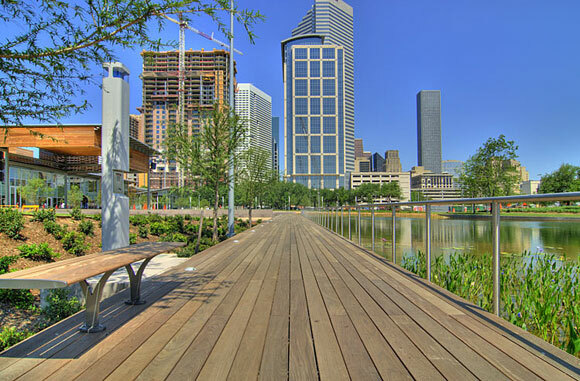 It will be an ideal place to walk the dog, hang out with friends, have a drink with co-workers, and let your children play or exercise," said Guy Hagstette, park director for the Houston Downtown Park Conservancy. 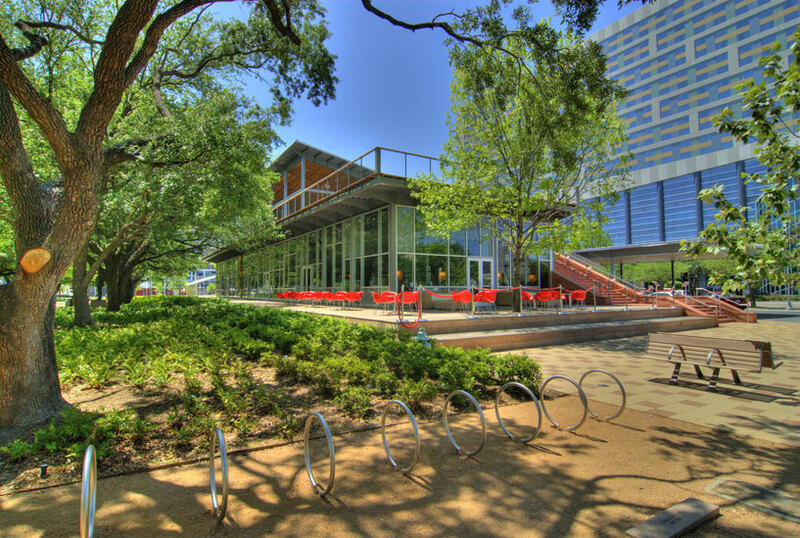 "Discovery Green is a park designed for everyone to enjoy." 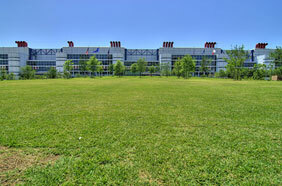 The Conservancy, a non-profit corporation formed by a group of private foundations, together with Mayor Bill White announced the development of Discovery Green in October 2004. Acquisition of the land concluded shortly thereafter. 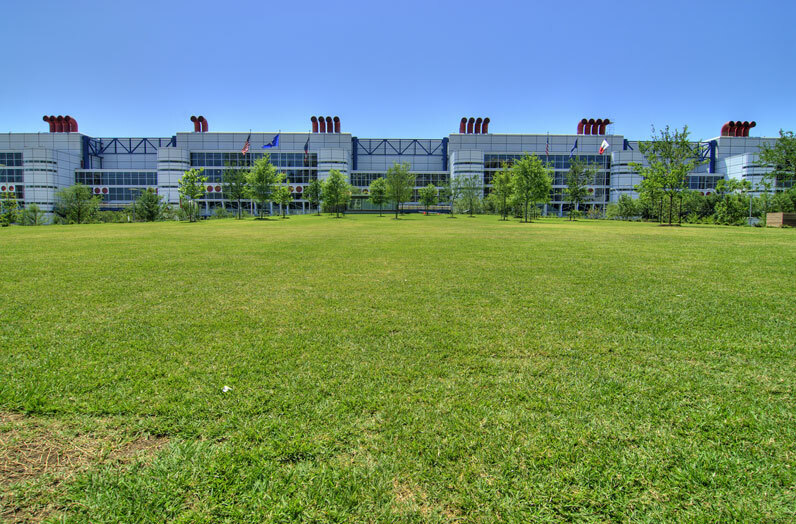 While the City of Houston donated $41 million through contributions of land and street right-of-way, the Conservancy was charged with raising an additional $40 million through private donations. "We are ecstatic that we are able to reach our fundraising milestone early on, but we will continue to raise funds throughout the duration of the project to support all of the features that the public requested and first-rate management and programming once the park opens," said Nancy Kinder, Chair of the Conservancy. "Our goal is to create a great urban park that will literally become downtown's backyard and be inviting to the public." 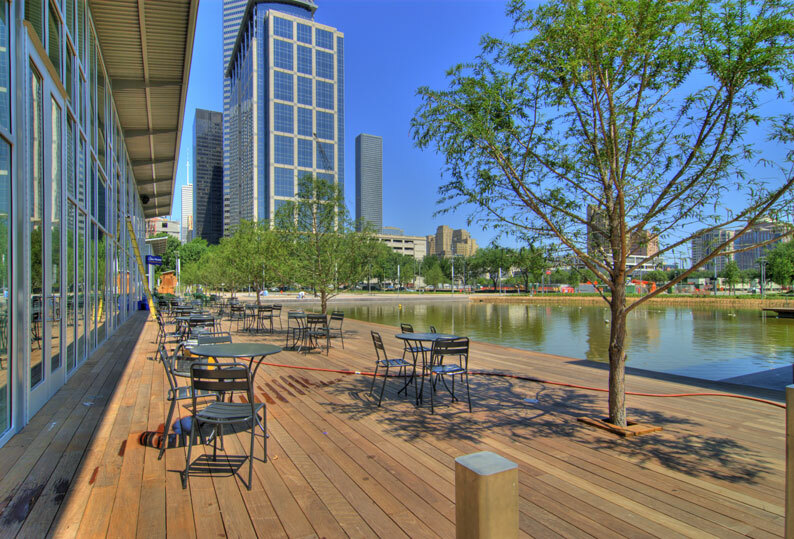 The Conservancy and its design consultants invited the public to provide input on the design and amenities needed in Discovery Green park. 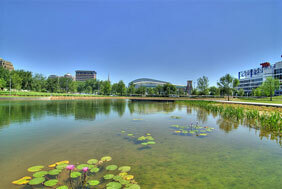 Based on the public's feedback, the design team incorporated gardens., recreation areas and promenade area that can be used for various temporary arts and community festivals, and pond (Kinder Lake) for model boats, a full-service restaurant, the Grove, with a "treehouse deck," a casual cafe. the Lake House, and an area for a farmer's market and an underground parking garage. "I am pleased with the progress the Downtown Park Conservancy has made on the park and their ambitious timetable," said Mayor White. "This is a great example of a public-private partnership that works for the city and for future generations of Houstonians."